Many customers ask about my philosophy on neck rods. Neck rods were introduced, by Gibson, in the 1930’s as a production device as the players moved up the neck, playing Jazz chords behind Swing bands. Gibson was notorious for using the cheapest Mahogany at the time, as the large number of peg head fractures on Gibsons will demonstrate. The light wood helped the tone, but the real reason for neck rods was to get the warps out of marginal necks in a production situation. The 14-fret neck needs a lot more rigidity than a 12 fret, as flex increases as the square of the length of the neck. Martin, National, and many other makers resisted the move to a neck rod for many years, until marketing pressures and the trend for ever slimmer necks continued. This trend led to guitars like the Mostrite, and Epiphones that are unplayable for people with large hands. The insistence on one-piece necks also leads to neck problems. Any tree has grown-in stresses and when a board is machined to make a neck, these stresses are relieved, making the neck warp in random directions. If the neck is made of two book-matched pieces of wood, the stresses will tend to oppose each other. If the two halves are sandwiched around strips of hardwood and/or graphite fiber, a very stiff neck will result. Neck rods have several inherent limitations. First, they replace the wood that is in compression in the neck. In effect, you are cutting out the heart of the neck wood and replacing it with a flexible piece of metal and then putting tension on the metal to keep it from flexing. I prefer making a stiff neck in the first place. Second, the metal neck rod has a different coefficient of thermal expansion than the wood. This means that when the temperature changes, the tension of the neck/rod system also changes. Third, the neck rod can rattle in its slot and waste the strings’ energy; the mass of the rod also can damp the vibration of the strings. Fourth, many necks are ruined by improper manipulation of the neck rod. Fifth, a neck rod is a dynamic system, and any change of tuning, strings temperature, and so on, will require adjustment. 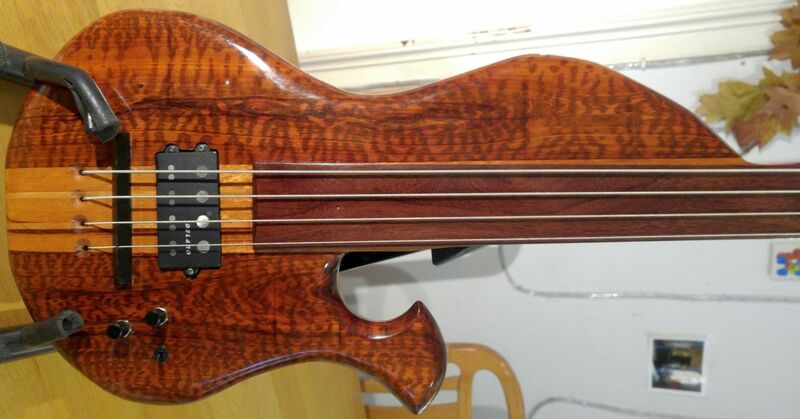 In addition, available neck rods are not long enough to run the whole length of my bass neck designs, and I think that a neck rod on half a neck is a very bad idea. Finally, and most importantly, thin, whippy necks are fast, and give the illusion of comfort, but for long sessions, an old style hand-filling fat neck will provide much better leverage and comfort, and might help prevent crippling Carpal Tunnel and similar injuries. I think this is especially important in basses, where the constant playing and big strings can lead to cramping and other discomforts. I have had several people tell me that they have been able to play my basses after years of being sidelined by tendinitis and similar injuries.